Hopefully, the wine to go with the film is not computer-generated. • We have to admit, when we heard Disney had teamed up with Costco to put a cartoon character on a wine label, we scratched our heads. About as good an idea as the candy cigarette, was our first thought. Then we went online and saw the trailer for the new Pixar film Ratatouille, and only two words came to mind: Brilliant. Marketing. 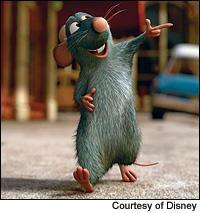 Ratatouille is the story of a rat named Remy who's working behind the scenes in a top Paris restaurant. The chefs, it turns out, are no good--it's the rat who's secretly adding spices and adjusting stocks to win diners' acclaim. Since food and wine go so well together, Disney has introduced the Ratatouille wine, being carried by Costco, to help promote the food-friendly film. Of course, the wine is French--a 2004 white Burgundy from the Mâcon's Château de Messey, and will be available Aug. 1 at Costco stores in 18 states for $13. We just hope it's OK to sneak some of the wine into the theater while we watch the movie. • Charlie Trotter's: behavioral psychology lab, or Chicago fine-dining restaurant? A bit of both, actually. Normally, the wine-pairing option with dinner at the restaurant runs guests $100 per person. But Chef Charlie Trotter reports that an interesting trend has emerged in the weeks since he's introduced a new wine option to accompany his cuisine. The premium wine accompaniment, which runs guests $225 per person, includes such selections as Krug Grande Cuvée Brut NV and 2003 Kistler Vine Hill Chardonnay. Since making the enhanced option available, Trotter said that, with just one wine option, about 30 percent of his guests chose to indulge. "Now that we've introduced an additional and more enhanced option," said the chef, "it's up to 40 percent, and it's basically split down the middle … If you provide more options for people, they just keep going for it." To keep those numbers on the rise, Unfiltered would like to suggest the Wine Spectator option, a 100-course meal featuring a glass of each wine from last year's Top 100. That'll go for $5,000. Fill your glass with the wine, not your water bottle. • A wine to improve your athletic stamina? That might be asking a little too much. In 1996, Gary Erickson and Kit Crawford--better known as the couple behind the Clif Bar energy bars sold in gyms, bike shops and health-food stores--purchased an 80-acre farm in Napa's Howell Mountain area where they could raise chickens and turkeys, grow organic fruits and veggies and ride horses. In 2004, plans for a winery emerged, and though no vines have been planted yet, the hope is to someday develop an estate vineyard. Using purchased grapes and the expertise of consultant Sarah Gott, former winemaker for Quintessa and Joseph Phelps, the pair has already released about 5,000 cases under the Clif Bar Family Winery label: a Cabernet Sauvignon Napa Valley Kit's Killer Cab 2003 ($35); a 2003 Napa Valley Merlot called Gary's Improv ($32), a tribute to Gary's skills as a trumpet player; a Syrah Napa Valley 2004 ($20); and The Climber North Coast 2004 ($15). A Sauvignon Blanc is also due for rollout in August. We haven't tasted the wines yet, but public reaction is pretty much what you'd expect. "Everyone is a comedian," said brand manager Linzi Gay. "Everyone asks if the wine will help them perform better on their bike ride." • Willamette Valley Vineyards in Oregon, the producer that turned heads by listing the amount of the antioxidant resveratrol contained in its wines on the labels, has decided that what seals the bottles should be healthy, too. Healthy for the planet, that is. The winery is now using only cork sourced from sustainable cork forests certified by the Forest Stewardship Council (FSC), an international entity dedicated to proper forest management. "Many of the people who strip bark off of the cork trees are using knowledge that was passed down from grandfather to father to son," said Jamie Lawrence, European Forestry Division Manager for the Rainforest Alliance, "and that tradition is currently threatened." According to environmentalists, more and more wineries switching to alternative closures is hastening the destruction of the cork industries of Portugal, Spain and northern Africa, so there's been a push to get wineries back on cork. The issue is definitely controversial, since the winery still has to take the loss if the corks are faulty, but Unfiltered does tip its hat to Willamette Valley Vineyards for taking a pro-sustainable stance.